This gem of a trail just east of Marias Pass shows off the beautiful ruggedness of the east side of the Continental Divide. This trail drops down through meadows and pockets of aspens until it joins with the Autumn Creek Trail and starts gaining elevation. It then switches to lodgepole forest, then forks off the Autumn Creek Trail to meadows with low sub-alpine fir and excellent views. 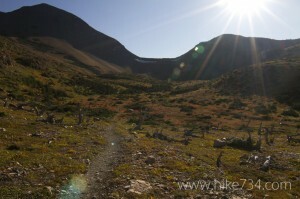 The hike then wraps around the north shoulder of Calf Robe Mountain, where some snow may linger. When you reach the beautiful basin below Firebrand Pass, huckleberry bushes and old silver logs will greet you. The surrounding peaks are breathtaking, and the trail leading to the pass is visible. The climb to the pass is well worth it, giving you lofty views of the mountains in the southeast corner of the Park. Trailhead: East of Marias Pass on US Highway 2 (and just east of an area called “False Summit”), you will find an obscure trailhead near mile marker 203. 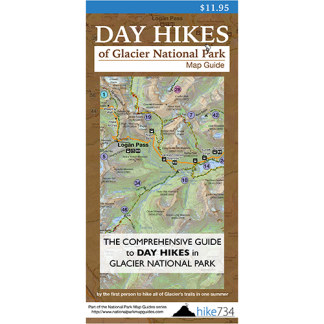 It is a pullout that drops below the highway and alongside the railroad tracks, which you will need to cross to reach the trail.